Advantages: Logical format, important but neglected subject; comprehensive coverage, profusely illustrated, easy to read text, large format. The second in Ian Allan Publishing's "Military Aircraft in Detail" series covers the Henschel Hs 129. The author is well known Luftwaffe and Rumanian aircraft researcher Denes Bernad. The Henschel Hs 129 was a purpose-designed, heavily armoured and armed tank destoyer. The Spanish Civil War was used as a testing ground for new military technologies. Legion Condor successfully employed the Stuka dive bomber to handle stationary or slow moving targets such as buildings or ships, but there was no satisfactory weapon to efficiently deal with tanks and other fast-moving armoured and soft-skinned vehicles. Tenders were therefore called for a heavily armed and armoured aircraft to operate at low levels over the battlefield. Hamburger Flugzeugbau, Focke-Wulf and Henschel responded to the specification, with the Henschel design winning in the last round of selection against Focke-Wulf's Fw 189 S.
This new title follows the same format as the first in the series - 96 glossy pages between soft covers, with descriptive text supported by 150 photos and diagrams. The book is logically organised, commencing with background on the requirement for a tank-killing aircraft, followed by the selection process; development of the Hs 129; pre-series production, the Hs 129 B-1 - a greatly improved machine compared to the A variant; then the B-2; ordnance and weapons including trials; final developments and the end of the tank-killer - due to high fuel consumption! Appendices include a reconstructed Hs 129 Production Table, a list of Aircraft Variants and flight statistics, and Specifications (basic and detailed). The pages are prolifically supported by wartime photos and technical drawings. The Henschel Hs 129 was undoubtedly an important and successful aircraft, and a true pioneer in the field of aerial tank hunting. Despite this, it remains under-documented. 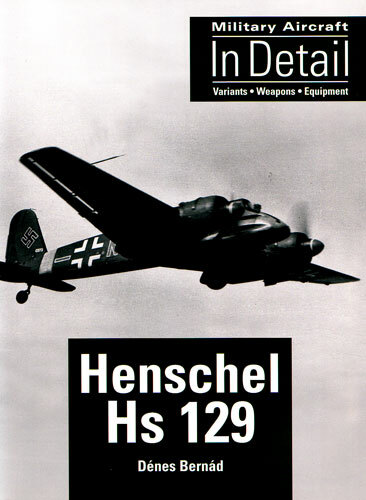 Denes Bernad's "Henschel Hs 129" book helps address this shortage of information, and will be welcomed by modellers and Luftwaffe enthusiasts alike.